Gol to start codesharing with Aerolineas Argentinas. Are TAP Portugal and Etihad next? Brazil’s Gol plans to begin codesharing with Aerolineas Argentinas in Mar-2014, finally moving to the implementation phase of a partnership which was initially forged in late 2011. The partnership will significantly improve the two carriers’ position between Argentina and Brazil, a large market now controlled by LAN and TAM parent LATAM. For Gol, Aerolineas will become the low-cost carrier’s second two-way codeshare partner after Delta Air Lines. Gol has been carrying the code of several carriers for several years but until recently lacked the technology to sell on other airlines. It is now discussing potential two-way partnerships with several carriers, including TAP Portugal, as part of its new international strategy while looking at expanding its own network including to Africa. For Aerolineas, the partnership is the carrier’s first in South America and results in significantly improved access to Latin America’s largest market. It supplements several codeshares Aerolineas has been working towards since joining SkyTeam in 2012. Gol and Aerolineas Argentinas first signed in Nov-2011 an MOU for a codeshare and frequent flyer tie-up. The two carriers originally aimed to begin codesharing in 2012 but the deal was held up pending an IT upgrade at Gol which was needed for the Brazilian carrier to sell on Aerolineas-operated flights. Gol was one of the first low-cost carriers to adopt an alliance strategy and has been actively pursuing codeshares with foreign full-service carriers serving Brazil for over five years. But Gol has been much slower than other hybridizing LCCs in upgrading its reservation system to support two-way codeshares. Gol in 2013 finally implemented the technology to sell flights operated by other carriers on a free-sale basis, allowing it to start selling Delta-operated flights. The carrier initially planned to upgrade its reservation system to support two-way free-sale codeshares in 2007 but repeatedly delayed the project. Gol’s first codeshare, with Panama’s Copa in 2005, was a manual block space arrangement in which Copa set aside a fixed small number of seats for Gol between Panama City and Sao Paulo while Gol provided Copa connections within Brazil. All of Gol’s subsequent codeshare partners – Air France (from 2009), KLM (from 2009), American Airlines (from 2009), Iberia (from 2010), Delta Air Lines (from 2010), Qatar Airways (from 2011) and Alitalia (from 2013) – were limited to Gol-operated flights. While Gol had several codeshare partners before Aerolineas, the two carriers did not see the point of starting their partnership without two-way functionality because Brazil-Argentina is a high frequency short-haul market. A Gol executive recently told CAPA that the two carriers are keen to use their new partnership to set up an air bridge between Buenos Aires and Sao Paulo, giving passengers more flights to choose from and providing a better competitive response to LATAM. 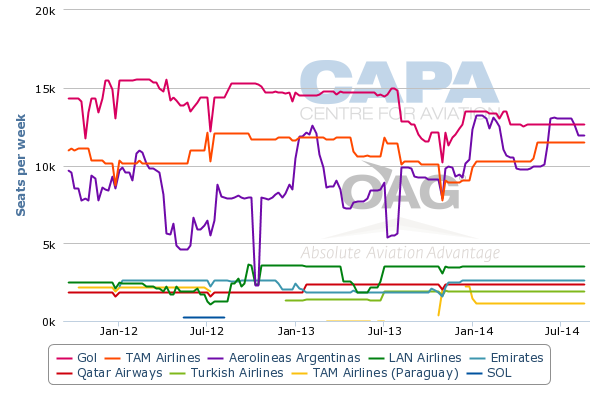 LATAM has enjoyed a strong position in the Buenos Aires-Sao Paulo market since the group was established in mid-2012 from the merger of LAN and TAM. LAN has a Buenos Aires-based affiliate, LAN Argentina. The LAN and TAM brands combined currently account for 45% of total capacity between Buenos Aires and Sao Paulo. The new Aerolineas-Gol partnership, which Brazilian competition authorities approved in Jan-2014, account for a 38% share. The remaining 17% is held by Qatar Airways and Turkish Airlines. Qatar and Turkish have pick-up rights in the Sao Paulo-Buenos Aires market as part of tag flights originating in Doha and Istanbul respectively. According to OAG data, LATAM and the new Aerolineas-Gol combination both currently offer nine daily flights from Buenos Aires to Sao Paulo. 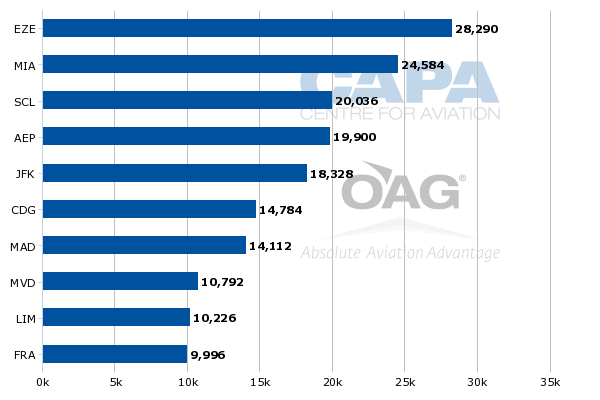 LATAM has a slightly higher share of capacity because two of its flights are operated with A330 widebody aircraft (the other seven are operated with A320s) while all of the Aerolineas and Gol flights are operated with narrowbody aircraft (primarily 737s and some E190s). LATAM’s offering includes three LAN-operated flights from Buenos Aires Ezeiza to Sao Paulo Guarulhos and six TAM-operated flights, including three from Ezeiza and three from Buenos Aires Aeroparque. The TAM-operated Ezeiza flights include two A330 frequencies from TAM and one A320 frequency from affiliate TAM Paraguay. While Guarulhos is the only international airport in the city of Sao Paulo (more centrally located Congonhas is only open to domestic flights), Argentina opened its downtown airport Aeroparque in early 2010 to some regional international flights including Brazil. According to OAG data, Gol currently serves the Buenos Aires-Sao Paulo market with three daily flights from Aeroparque and two daily flights from Ezeiza. Aerolineas has four daily flights to Sao Paulo, including three from Aeroparque (plus a fourth frequency operating only on weekends) and one daily flight from Ezeiza. The combined nine frequencies, particularly the market leading six flights from convenient Aeroparque, will give Aerolineas and Gol a better proposition in the business sector. Buenos Aires is by far the largest international market from Sao Paulo. Ezeiza alone is the largest international route from Guarulhos while Aeroparque is the fourth largest, only behind Miami and Santiago. 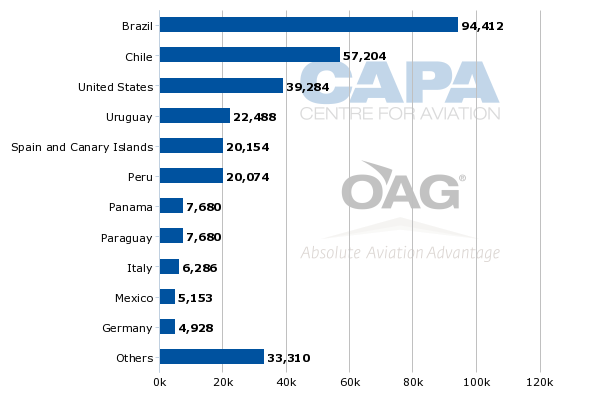 Argentina currently accounts for about 18% of total international seat capacity from Brazil, making it Brazil’s second largest market after the US, according to CAPA and OAG data. For Argentina, Brazil is by far its largest international market, accounting for about 30% of total international capacity. The Aerolineas-Gol partnership will also cover secondary routes in the Argentina-Brazil market as well as services beyond the two carriers’ hubs. While LATAM only operates two Argentina-Brazil routes besides Buenos Aires-Sao Paulo, the Aerolineas-Gol combination operates more than 10. Aerolineas and Gol currently account for a combined 54% of total seat capacity between the two countries while LATAM accounts for 32%. Aerolineas currently serves nine cities in Brazil (six year-round) with a 10th, Curitiba, to be launched on 1-Mar-2014 with a daily flight from Aeroparque. Rio de Janeiro is the carrier’s second largest destination in Brazil, with 24 weekly flights from Aeroparque, seven weekly flights from Ezeiza and two weekly flights from Iguazu in northern Argentina. Aerolineas also serves Porto Alegre with one daily flight from Aeroparque and Belo Horizonte with six weekly flights from Aeroparque. The capital Brasilia, which was added in 2013, is served with six weekly flights from Ezeiza. Florianopolis, a beach destination in southern Brazil which is popular in the southern hemisphere summer season, is currently served by Aerolineas with 16 weekly flights from Aeroparque and one from Cordoba. Aerolineas serves Florianopolis year-round but with a less than daily service during off-peak months. Salvador, a beach destination in northern Brazil, is served seasonally with up to three weekly flights from Ezeiza. Porto Seguro, another beach destination in northern Brazil, is currently served seasonally with two weekly flights while Cabo Frio is served with one seasonal weekly frequency. According to OAG data, Gol currently operates eight routes between Argentina and Brazil including its two Sao Paulo-Buenos Aires routes. The other six routes include four from Ezeiza – daily flights to Florianopolis and Rio de Janeiro Galeao, 12 weekly flights to Porto Alegre and five weekly flights to Curitiba – as well as a daily flight from Sao Paulo Guarulhos to Cordoba and four weekly frequencies from Guarulhos to Rosario. TAM operates just two other Argentina-Brazil routes, a twice daily Ezeiza-Rio de Janeiro service and a daily Rosario-Sao Paulo service. LAN only serves the main Buenos Aires-Sao Paulo market. 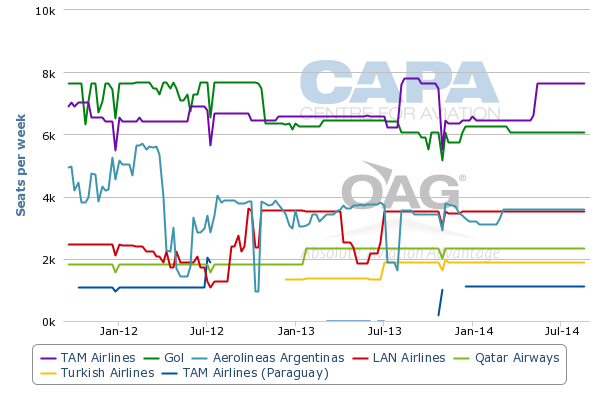 While the implementation delay was caused primarily by Gol’s IT issues, the codeshare is in some respects a bigger milestone for Aerolineas given the Argentinean carrier’s small number of codeshare partners. Aerolineas did not have any codeshare partners when it joined SkyTeam in Aug-2012 but has since been working on tie-ups with several SkyTeam members. Aerolineas only regained the ability to codeshare in 2011 when IATA let the carrier back into the clearing house. Aerolineas had been kicked out of the IATA clearing house in 2001 because of unpaid debts. At the time of Aerolineas' ascension into SkyTeam, the carrier was expecting to start codesharing with Delta Air Lines, Air France, KLM, Aeromexico, Air Europa and Alitalia. Delta, which sponsored Aerolineas’ membership into SkyTeam and forged a codeshare deal with the Argentinean carrier in 2011, was initially expected to be Aerolineas’ first codeshare partner. But the Aerolineas-Delta codeshare has still not been implemented. Instead KLM became in Dec-2012 Aerolineas’ first codeshare partner in over a decade. A codeshare with Air France was added in Oct-2013. Aerolineas continues to work towards implementing codeshares with several other SkyTeam carriers while Gol becomes its first partner outside SkyTeam. More partnerships are an important component of Aerolineas’ new strategy as the carrier continues to work on restructuring its highly unprofitable international operation. Gol is close to Delta, which acquired a small stake in the Brazilian carrier in late 2011. But Delta has been unable to persuade Gol to join SkyTeam. Gol for now does not have any plans to join a global alliance and instead continues to pursue new codeshares with members of different alliances as well as non-aligned carriers. With Brazil’s other major carrier, TAM, joining Star in 2010, Gol was essentially left as the preferred Brazilian partner for members of SkyTeam and oneworld. But with TAM switching to oneworld at the end of Mar-2014, new opportunities to work with Star carriers are emerging while Gol’s oneworld partners are able to tie up with TAM. Gol’s codeshare with American Airlines, which began in late 2009, has already been deactivated although the two carriers continue to maintain an interline relationship (Gol has over 30 interline partners). Gol’s codeshare with Iberia is also expected to be deactivated but Gol is talking to new potential European partners, including Portuguese carrier TAP. Gol’s codeshare with Qatar, which is also in oneworld, may also have to go but could be replaced by a partnership with Etihad. Etihad could use domestic feed in Brazil as it launched services in 2013 to Sao Paulo. Etihad will gain offline access to a huge swathe of Latin America via its new extensive codeshare with Air Europa but the Spanish member of SkyTeam only serves one destination in Brazil, Sao Paulo. Gol is an ideal fit for Etihad, providing the Abu Dhabi-based carrier access to the rest of Latin America’s largest market. Gol and Etihad already began interlining in Oct-2013. An upgrade of the relationship to a codeshare would be logical. As CAPA previously reported, Etihad has been keen to add a South American codeshare partner since launching its Sao Paulo service. “Adding a codeshare partner from Latin America is key as Etihad does not have any short-term plans to serve the region beyond its recently launched service to Sao Paulo,” CAPA stated in an analysis that was published on 26-Jun-2013. But a far bigger prize on the horizon for Gol is TAP. The Portuguese carrier, a Star member, is by far the largest carrier in the Brazil-Europe market and serves 11 Brazilian destinations with two more to be added in mid-2014. TAP is keen to work with Gol after TAM, which it uses to feed its Brazilian gateways, leaves Star. Avianca Brazil is in the process of joining Star but is much smaller than Gol or TAM. Avianca Brazil has a decent domestic network at Sao Paulo Guarulhos which may be sufficient for several Star members. But it does not have a big presence in the regional market and is not able to feed TAP at several of its secondary Brazilian destinations. Gol also has been discussing a possible codeshare with Ethiopian Airlines, which began serving Brazil in 2013. In addition Gol continues to look at serving Africa using its own all-737 fleet. But Africa is not Gol’s biggest priority at the moment, as evident in its decision not to move forward with an original plan to launch service from Recife in northeast Brazil to Lagos in Nigeria by the end of 2013. Gol, however, remains interested in opening routes to Africa using its 737NGs and in future its fleet of 737 MAX 8, which come with improved range and economics. Gol is not interested in re-establishing a widebody operation but sees opportunities for medium-haul routes. The carrier briefly operated long-haul scheduled services using 767s in 2007 and 2008. Gol resumed services to Florida at the end of 2012 with one-stop services via the Dominican Republic using payload restricted 737s. Gol has been planning to establish a Dominican subsidiary to take over the flights. But the launch of Gol Dominica has been delayed multiple times and the project could be dropped entirely as Gol relooks at the viability of competing in the Brazil-Dominican Republic-US market. Operating services to Africa are more attractive as Brazil-Africa is an undeserved fast-growing market. In contrast the Brazil-US market has suffered from overcapacity, making it challenging for Gol to compete with its one-stop product to Miami and Orlando. Gol is keen to build up its international network – both organically and virtually – to reduce its reliance on the Brazilian domestic market, where conditions have been challenging. The new partnership with Aerolineas is a significant development as it will improve its position in a strategic market and help Gol compete better with rival LATAM. Argentina is already Gol’s largest international market, accounting for nearly half of its international capacity. Aerolineas, Delta and potentially TAP could emerge as Gol’s three main partners. With TAP and Aerolineas the third and fourth largest foreign carrier in Brazil – after American and LAN – Gol should be able to build a more significant presence in the international market while becoming a more formidable competitor to LATAM and its oneworld partners.